St Alfege, the archbishop of Canterbury killed by a band of Danes in 1012, was an Anglo-Saxon martyr and an important saint at Christ Church. 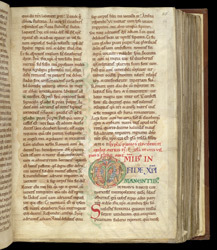 Osbern, life-long monk and later prior of Canterbury, wrote his life at the command of archbishop Lanfranc about 1080 when Alfege's sanctity was in dispute. Medieval 'Lives' are arguments for saints, building them up as examples of holiness, and hardly ever historical in a modern sense. This page has the prologue of Osbern's 'Life of Alfege'. His relics were kept for eleven years at St Paul's, London, until Canute, a conspicuously Christian Danish king of England, brought them back to Canterbury in 1023. Today Alfege's relics are at Bath, Glastonbury, Ramsey, Reading, Durham, York and Westminster Abbey.